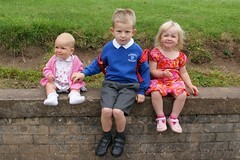 Today our big brother started school. He was away for six whole hours. We missed him but we think he had fun. When we are bigger we are looking forward to going to school with him.